You have determined you need a Content Management System (CMS) and have begun the daunting task of reducing the number of CMS products to a manageable number to evaluate in depth. Having reached this article you are aware of, or interested in, CMSs that can be described as: Headless CMS, API First, Platform as a Service (PaaS), Decoupled CMS, Cloud-First. I am sure there are more beautiful categorizations and terminology provided by the latest analyst buzz. As much as I may not like the catagorizations, they are useful in that without them what would you search for? But as you will have discovered, there are a number of CMS products catagorized as Headless CMS, or API First, etc. Cloud CMS is just one of many products you will find with a simple search. How to evaluate further: features, cost, trial, openness of information? It is still difficult to compare products. At Cloud CMS we believe we have the best product as I am sure all our competitors believe in their products. To an extent we are all telling the truth and it really depends what criteria or features are important to you. Regional restrictions: ie the content must reside in a particular region. This may be legal or a business restriction. Control: A benefit of SaaS is that updates and bug fixes occur ‘continuously’. Usually the whole process is transparent to the customer. For some organizations and application the constant change is not acceptable. A change could introduce a change of behavior in the application which could adversely affect users. Hence, on-premise can stabilize a release and allow the customer to control the release cycle for their users. MicroService: With your own on-premise installation you can scale and fine tune the Cloud CMS components. Not least, reducing network latency by hosting close to your applications and users. This is the CMS your architects would build if they had the time and resources (and were in the CMS business). 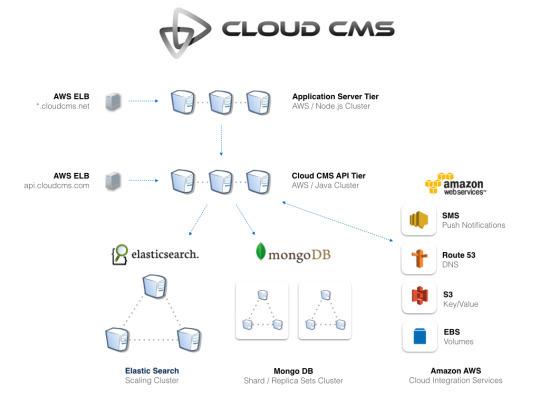 Cloud CMS runs on top of MongoDB, ElasticSearch and Amazon AWS. I hope this article has saved you some time. Either you have found out early that you are looking for a different type of CMS, e.g., a page builder CMS, and Cloud CMS is not for you. Or, this has helped encourage your interest in Cloud CMS and you would like to find out more - please Contact Us to ask a question, request a demo or call, or start a trial.